When working with strong flavors, like strong colors, it is important to keep them in balance with other flavors, so that one does not overpower another and cover up the more subtle flavors. Sharp sours, fiery spiciness and cutting bitterness can make peace and share the stage without conflict. Here is where the art of Thai cooking lies: the creation of flavor harmonies that bring together seemingly disparate flavors and integrate them into a unique and magnificent whole. Your own cooking experience may have already revealed to you that the salty and sweet flavors balance each other. If something is too sweet, add a little salt; if it is too salty, add a little sugar. Taking this a step further, both the sweet and salty flavors balance the sour. 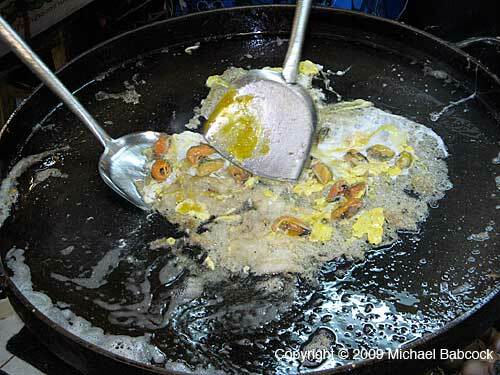 For instance, if a dipping sauce is much too sour, determine first whether you can taste the salty flavor. 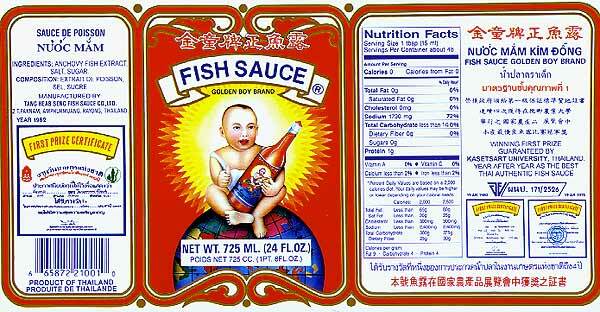 If not, add a little salt (or fish sauce if the recipe uses fish sauce as the salty ingredient). When the sauce tastes equally salty and sour, the addition of a little sweet often helps pull these two flavors together, so that they do not stand alone as separate ingredients, but embrace each other as partners. At the same time, this will enable you to taste their distinctive sources, as well as the flavors of other ingredients that may be in the sauce. 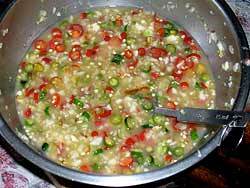 Therefore, instead of just sour, you may now notice that the sauce is limy, garlicky if there is garlic in it, and may even taste hotter than before since you are better able to taste the flavor of the chillies swimming in it. 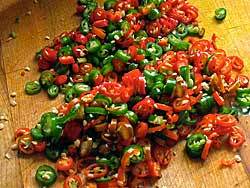 The sweet flavor, on the other hand, is also known to mellow out the heat of chillies, but usually, it tightens flavors first until you are able to taste a very faint sweetness in the back of your tongue. The harmony of the sauce peaks at this point and any further additions of sugar mellows out the heat as well as the sour and salty flavors. 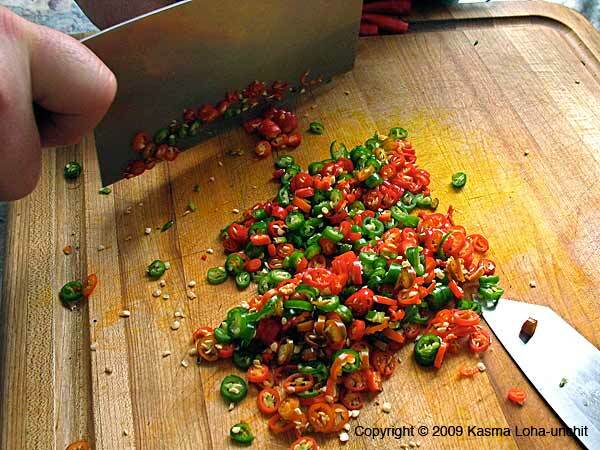 When working with strong sour, salty and hot flavors, the sweet flavor serves an important balancing function. It harmonizes the disparate flavors, pulling them together into a whole greater than the sum of its parts, and opens up doorways for your taste buds to taste the multi-dimensional flavors of all the ingredients in the dish. 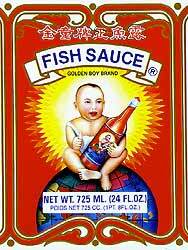 The fresh bouquet of aromatic herbs, unique textural taste of vegetables, and the delicately sweet and luscious flavors of fresh seafood come through the strongly flavored sauce to the foreground and are not smothered by it. At the same time, the bitterness of pungent roots and roasted spices takes a seat in the background, adding its own virtues like bass in an orchestra. Strong sour flavors, especially, benefit greatly from the balancing role of sweet. Frequently, a significant amount of sugar is required in order to bring about this balance. Just a small pinch may have little effect, and sometimes may even muddy up the waters – as if it has not yet convinced the strong players to cooperate. Keep adding a little more sugar until the faintest sweetness is noticeable in the back of your tongue. At this point, sugar is no longer needed as a peacemaker, but comes to the fore for its own sake, to be an equal player with the rest of the team. Whether or not more sugar should be added depends on whether the sweet component is an important feature of a particular savory dish. 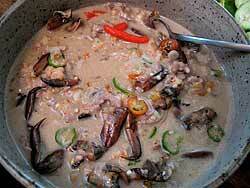 Its role varies from dish to dish and on the taste preference of the partakers of the meal. 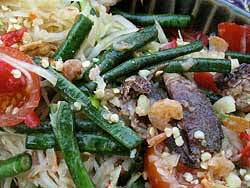 Of course, not all Thai dishes contain all five flavors in their full intensity. Some are actually rather plain and simple, using one or two flavor ingredients; others in-between. The Thai love for variety and harmony is reflected in the balance of dishes in a meal. 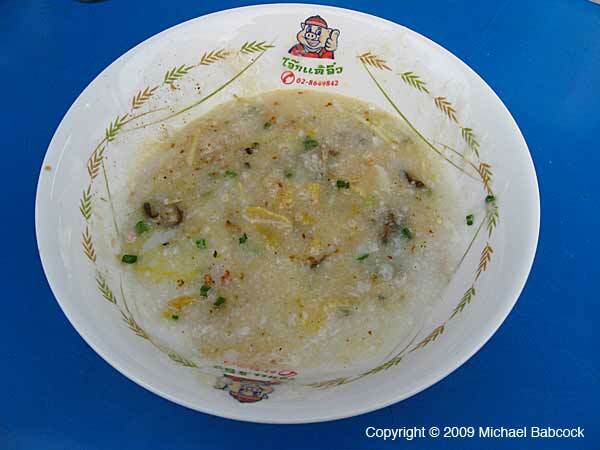 A typical meal consisting of five dishes would usually have one, or at most two, intensely hot dishes, accompanied by one or two of medium-range spiciness and the remaining mild and bland. 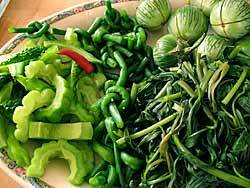 If there is a sharply sour salad or soup, the rest of the dishes are not likely to contain the sour flavor to clash with it. 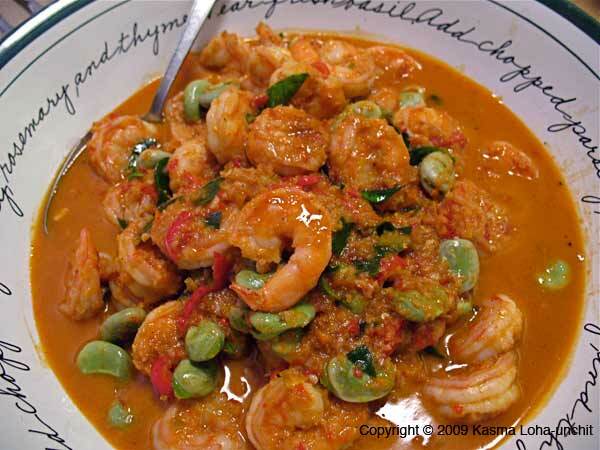 If a rich curry is on the menu, the accompanying dishes can be expected to be light and coconut milk will not be used in any of them. And so on. In short, not only should flavors be in harmony within a dish, all the dishes in a meal should be in harmony with one another. 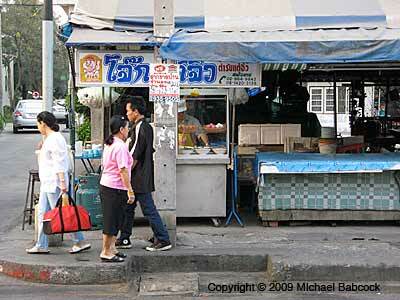 Note: Harmonizing flavors lies at the heart of Thai (or, indeed) any cuisine. 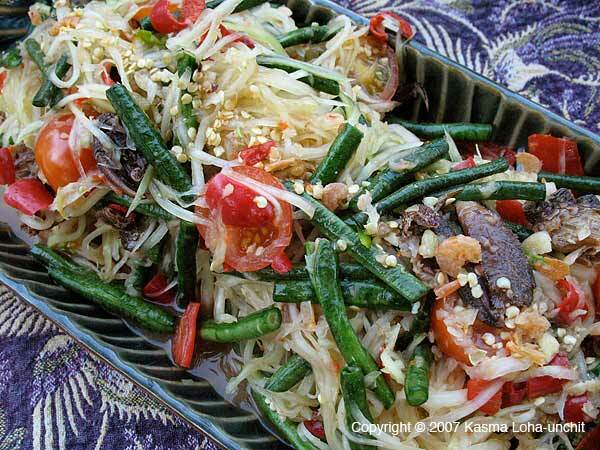 Kasma emphasizes frequent tastings in her Thai cooking classes to help teach the principles. You might enjoy Kasma’s articles Creating Harmonies with Primary Flavors and Balancing Flavors: An Exercise. We have recipes on our website for two of the above dishes, Mom’s Good & Easy Steamed Fish (Bplah Neung) and Stir-Fried Shrimp with Sadtaw or Fava Beans (Gkung Pad Sadtaw). 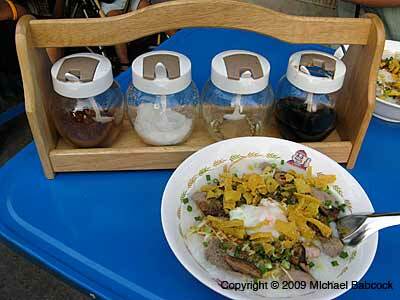 You might also enjoy the blog entry on Thai Cooking with Jam, Sauce or No Sauce? 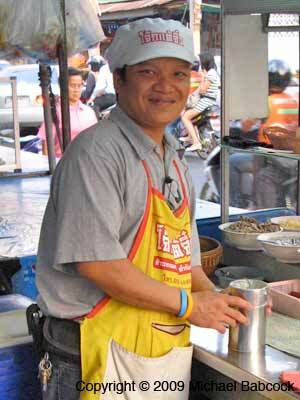 Over the years traveling in Thailand I’ve always enjoyed the van rides around the country. I love seeing the scenery and watching life unfold by the side of the road. And then there are the motor scooters. 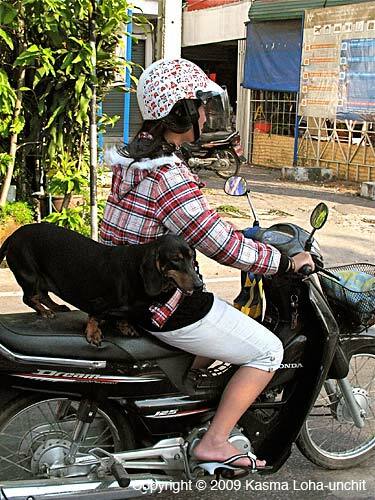 In Thailand, you never know what you’re going to see go by on a motor scooter. Kasma took this picture of a dog balancing on a motor scooter as it shot past the van in Chiang Mai traffic. Apparently the pooch has great balance! She said it was one of many such scenes that she saw during her trips the past year. The most people I’ve ever seen on a scooter was 6 (one of them was a babe in arms) but it’s relatively common to see a family of 4 or 5 perched on a scooter, at least out in the countryside – you don’t see it as much in Bangkok. I took the photo to the right in Hua Hin at a stop-light – presumably the three children are being “bussed” off to school. On one of our travels in Thailand, Kasma and I ended up on an island where motor scooters were the only mechanized form of transportation. After getting off the ferry, there was only one guy on a motor scooter left to take us to the resort on the other side of the island, so the two of us, with a piece of luggage each, piled on behind the driver. At least he took it slow! 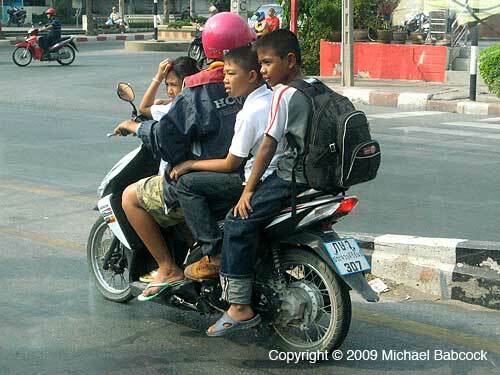 In Bangkok you’re likely to see motorcycle taxis that you notice primarily for the dare-devil antics past your window as you sit in traffic. I think of them as a thrill sport – the one ride I took (and it was on a relatively slow street) was enough for a lifetime! Young women in skirts usually ride side-saddle on the back. 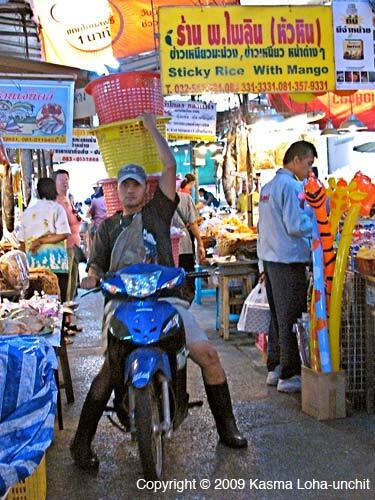 Motor scooters also function as pick-up trucks. You’ll see almost anything being carried on the back, from television sets, to ladders (4 on one scooter), to produce, a Buddha statue, piles of boxes . . . nearly anything you can think of. 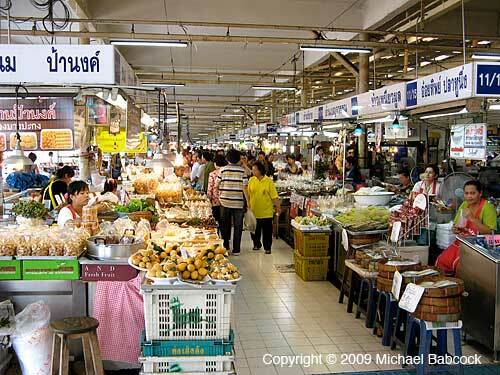 Kasma took this picture at the (indoor) market in Hua Hin. 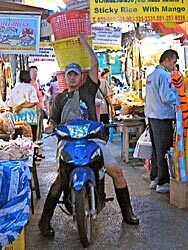 It’s fairly common to have motor scooters inch past you in the crowded lanes of a market, often, as we see here, laden down with deliveries going to the vendors. While most Americans have long settled into the new year, there is a group of us Southeast Asians yet to celebrate our traditional New Year. The Hindu-Buddhist cultures of Cambodia, Laos, Myanmar and Thailand are gearing up for our approaching grand celebrations on April 13, 14 and 15. This is a festive time of year, full of merriment and close family reunions. Young people visit elders, bearing gifts and scented water to anoint their hands in gestures of reverence. In return, they receive blessings and words of wisdom. 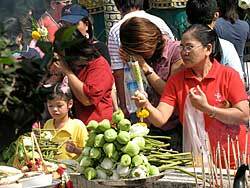 Families gather and all take part in preparing elaborate offerings of food and flowers to present to monks in the temples in colorful merit-making ceremonies. 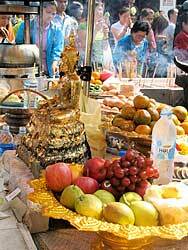 Sacred Buddha images are brought out from their places in the chapels, ceremonially bathed and paraded among the people. In the countryside, the New Year gives young men and women the opportunity to meet and play games together, usually in groups. They sing and dance traditional folk songs and dances. It is a time of courting and jestful playing. Being that this is the hottest time of year, water is thrown about at one another, both to cool off and as symbolic acts of bestowing blessings. It is a day when people dress in their finest, yet laugh and cheer as they get drenched by water coming from all those around them. Food stalls crowd temple and fair grounds with an extraordinary array of snack foods and sweetmeats to tempt every palate, while at home, extended families cook together exquisite feasts of seemingly endless courses. 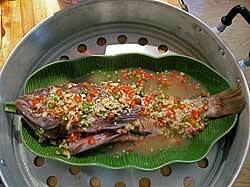 Special new year foods vary from region to region and country to country. In the heart of Thailand scorched by heat, a traditional food consists of a special rice, pounded and winnowed seven times before it is cooked, after which it is sifted into cold water, strained through seven layers of thin cloth, and finally soaked in cold water in an incensed earthenware pot and sprinkled with jasmine flowers. The scented rice is served with an assortment of dainty side dishes and condiments. 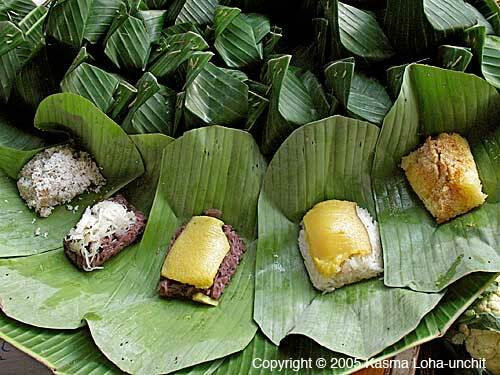 For most cultures, the New Year would not be complete without its luxuriant spread of delectable sweetmeats. Some are delicately wrapped in banana, bamboo and pandan leaves in packages of varying shapes and sizes. 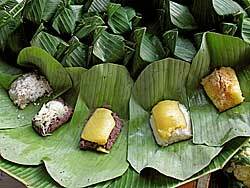 A log-shaped bundle holds sticky rice stuffed with banana and a few grains of black beans, while a miniature bamboo leaf-wrapped pyramid hides a gooey rice confection, and so on and so forth. 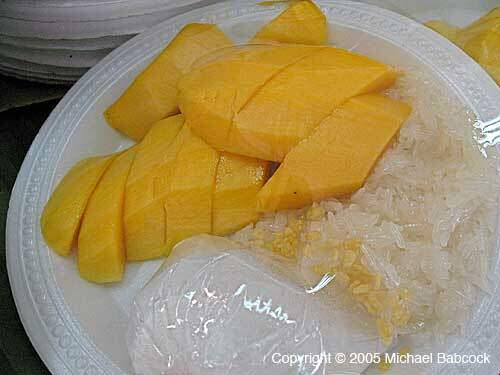 For me, all the abundance the New Year brings does not overshadow the glory of the hot season’s favorite treat – luscious ripe mangoes served with creamy coconut-flavored sticky rice (also called sweet rice or glutinous rice). Though eaten throughout the mango season from March through May, the golden color, sweetness and fragrance of the heavenly fruits are hard to beat as symbols of prosperity, especially when paired with the rich taste of the rice, a grain that reflects the fertility of the land. 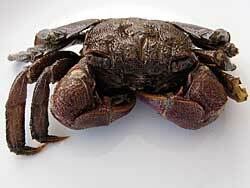 Furthermore, it is easy to make and the ingredients readily available from Asian markets in the Bay Area. 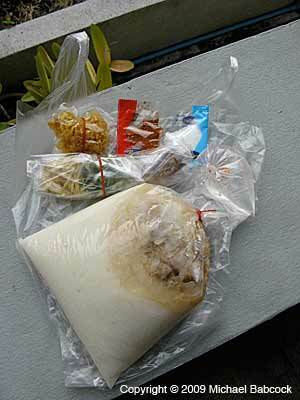 Rinse the rice, then cover with tap water 2-3 inches above the rice line and soakfour hours, or overnight. 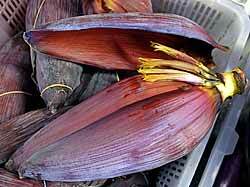 The rice will absorb much of the water, grow in size and soften, such that the grains easily break apart if pressed between the fingers. Drain and spread grains loosely in a shallow heat-proof dish. 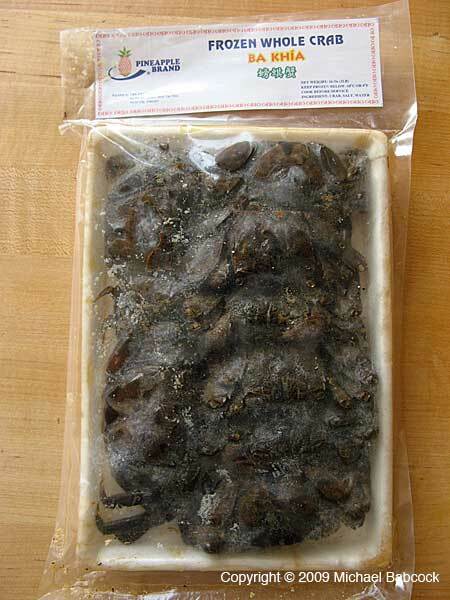 Place on a steamer rack and steam dry (without water added to the rice) over a pot with at least two inches of water on the bottom. Steam over medium heat for half an hour, or until the grains are translucent, cooked through but chewy. Or you can use a stacked steamer. If you are making a large quantity, in order to cook the grains evenly, use the special woven bamboo, cone-shaped basket for steaming glutinous rice, which fits on the companion spitoon-shaped pot with a collar to hold the basket in place. Fill pot with water to a level at least 2 inches below the bottom of the basket, and the basket with the pre-soaked rice. 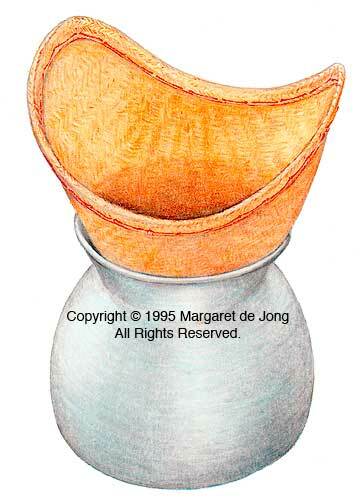 Cover with any round lid that fits an inch or more over the rice level. 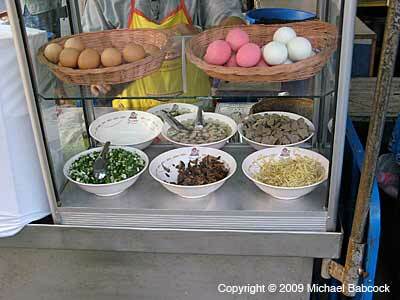 The basket-and-pot set is available from Southeast Asian markets. Alternatively, a straw or wire mesh colander that fits inside a steamer pot works well as a substitute. Avoid steaming the rice on top of a piece of cloth lining a steamer rack as any moisture the cloth absorbs may turn the bottom layer of grains into mush rather than cooking them in whole grains. 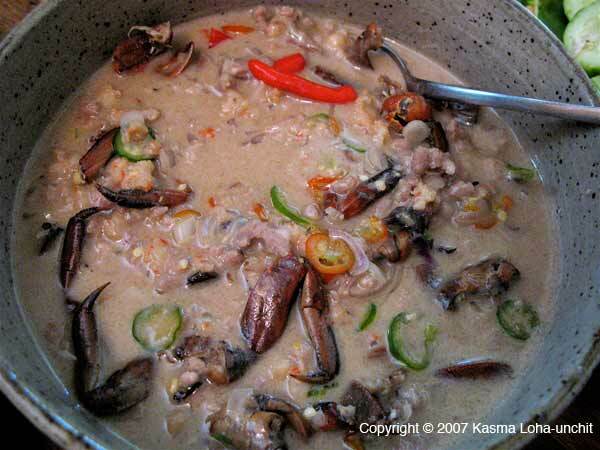 While the rice is steaming, prepare the coconut sauce by heating the coconut milk, sugar and salt together in a saucepan. 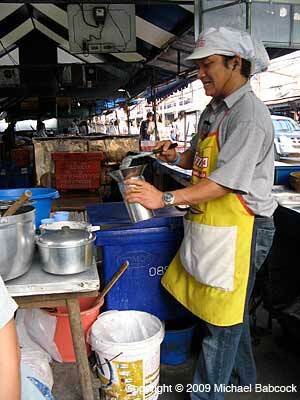 Warm the milk until the mixture is well blended and smooth. Mix the cooked rice while it is hot out of the steamer with half the coconut sauce. Stir well with a spoon to coat all the grains evenly. The rice should be moist but not swimming with sauce. 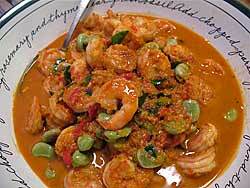 Add more of the sauce if needed, reserving the remainder for topping the rice before serving. 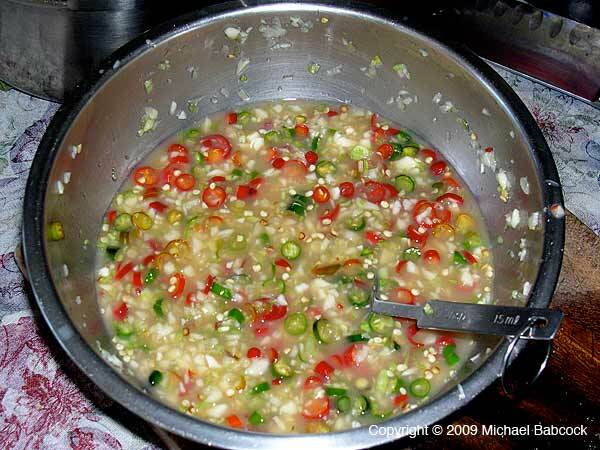 Let sit for at least 10 minutes to allow the grains to absorb the sauce. When ready to serve, dish onto individual serving plates, dribble a small amount of reserved coconut sauce over each portion and arrange mango slices over the top. Serve warm or at room temperature. 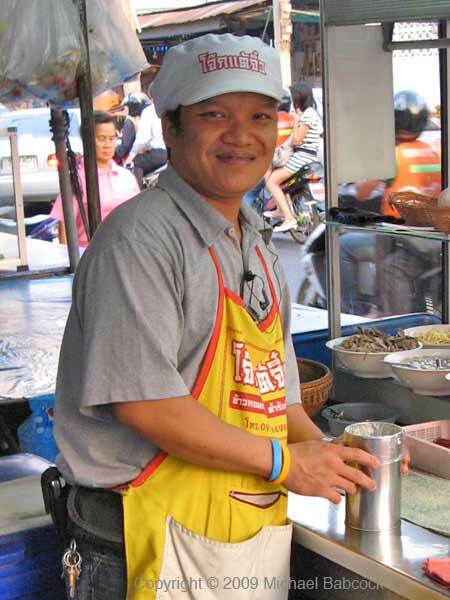 Kasma always gets a chuckle when people talk about Pad Thai as “the signature dish of Thai cuisine.” In Thailand it is just one of many noodle dishes, available mostly as a street food or at noodle shops and not particularly popular dish amongst Thais. It’s mainly a fast food. 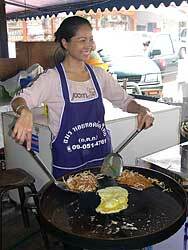 Kasma does have a very good recipe for Pad Thai and teaches it in her Thai cooking classes. Note: The official Thai spelling for this market is Or Tor Kor. This, unfortunately, leads most westerners to the wrong pronunciation. 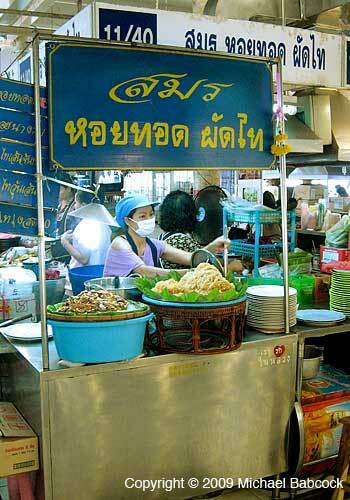 Aw Taw Kaw is closer to correct for pronouncing but less recognized; so I’ve used both interchangeably here. 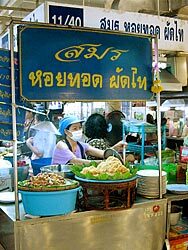 The one place where I sometimes order Pad Thai for myself is at a stand at Or Tor Kor (or Aw Taw Kaw) Market (Talaat Or Tor Kor, in Thai) in Bangkok, which also happens to be one of our favorite markets in Thailand. 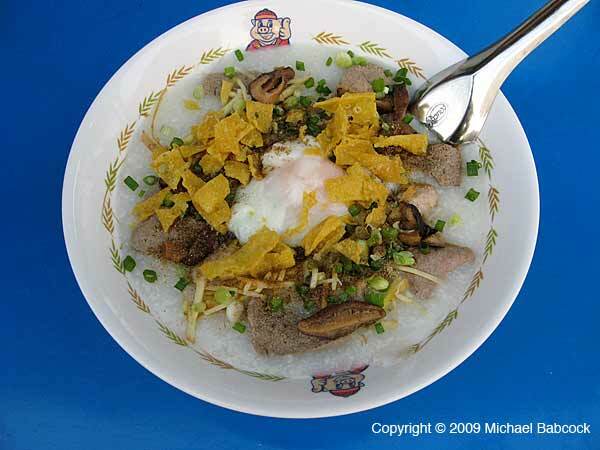 Although Or Tor Kor is considered “high end” and the prices are higher than at other markets, the selection of food and the presentation makes it worth the extra few baht. I still find it very reasonable by United States standards. 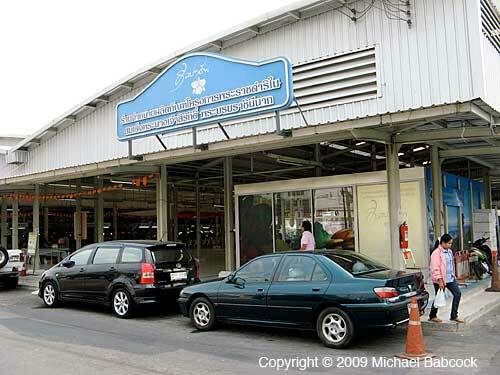 Our collection of Thailand market photos contains many pictures of this Aw Taw Kaw Market. Or Tor Kor market is very near to the well-known Chatuchak Weekend Market. 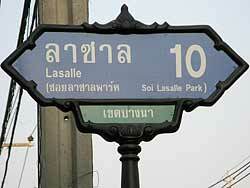 You can get there via the MRT subway – get off at the Kamphaengpetch Road station. The first picture above shows the outside of the market from the street. 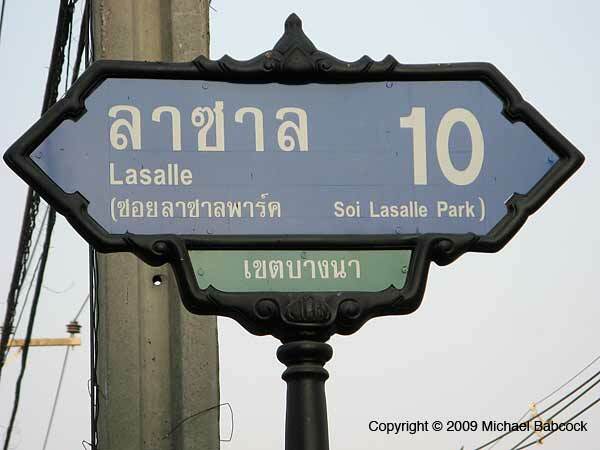 If you go on a weekend, you can also enjoy Chatuchak, with it’s estimated 8,000 vendors selling any and everything you can imagine. We usually go to Or Tor Kor on a weekday because it can get very crowded indeed on a weekend. If you’re going to Aw Taw Kaw, eat lightly beforehand. 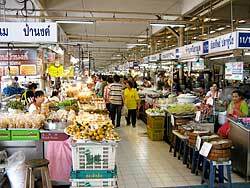 As you browse the aisles you’ll see pre-cooked food such as grilled prawns, satay, sour sausage, shrimp cakes as well as numerous kanom (snacks) such as sticky rice and kanom krok (rice pancakes) and it will be hard to resist grazing. 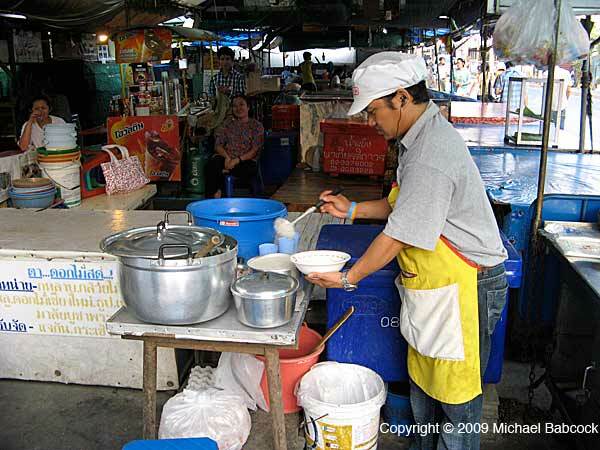 There are, however, numerous food stalls that cook food to order in the back of the market and many of them are worth a taste. The stand with the delicious Pad Thai is back in the eating area towards the outside edge of the market. 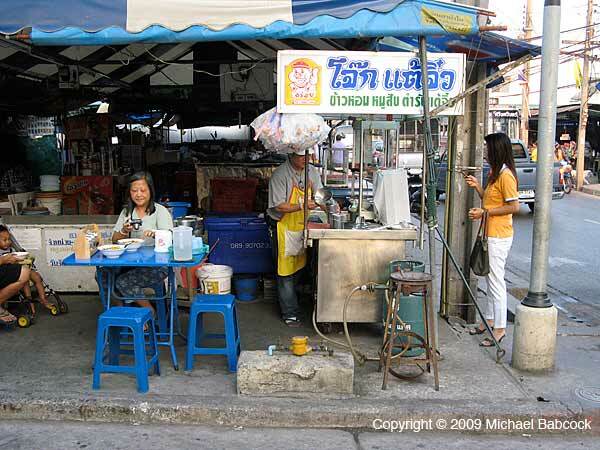 The third picture shows the stand with the stall number (11/40) visible in the background. 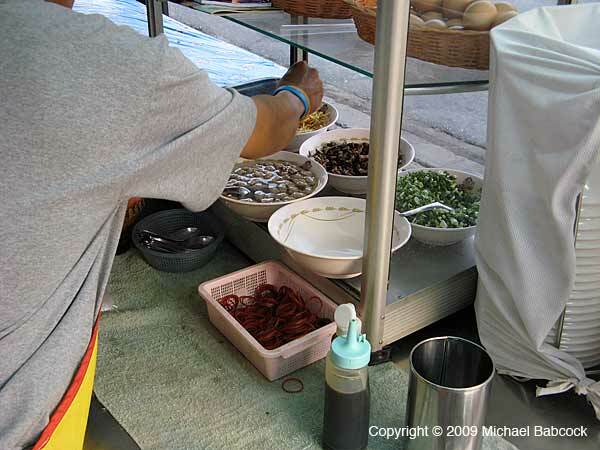 I actually had taken and delivered pictures of the woman making the dish many times before I actually ordered the dish, though Kasma had been ordering it for her trip members for many years. 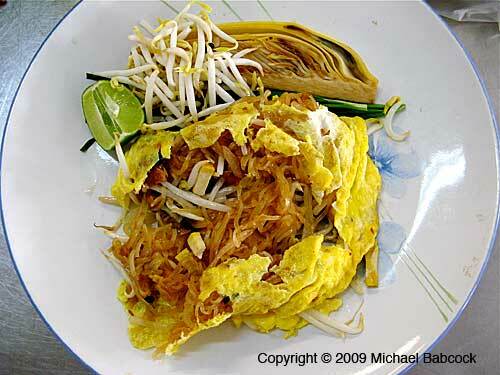 Most Pad Thai recipes call for egg, usually (as in Kasma’s Pad Thai recipe) scrambled lightly. This woman’s adds eggs in a different way – she uses them to make a covering for the noodles in the center, sort of a Pad Thai omelette, if you will. Kasma tells me that this presentation is relatively common in Thailand, particularly when Pad Thai is served in a restaurant. 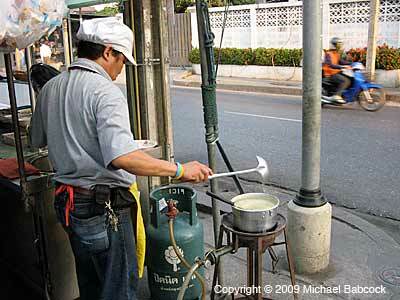 In fact, there are as many different Pad Thai recipes as there are cooks. (Kasma’s article on The Spirit of Thai Cooking talks a bit about how Thai dishes can vary a great deal depending on the cook.) It’s served (as you can see to the left) with a banana blossom, some scallions (underneath), fresh bean sprouts and a lime. The lime is squeezed over the noodles and the fresh ingredients are eaten along with it. As you can see, once you open up noodles it looks very delicious indeed. It bears little resemblance to some of the Pad Thai noodles you find in the states – it is savory and tasty and completely without Ketchup! For more information about the origins of Pad Thai, check out Kasma’s Pad Thai Notes and Pointers. 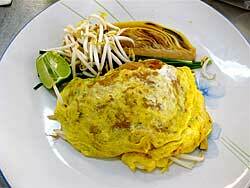 One other dish that the same woman makes is an mussel omelette. 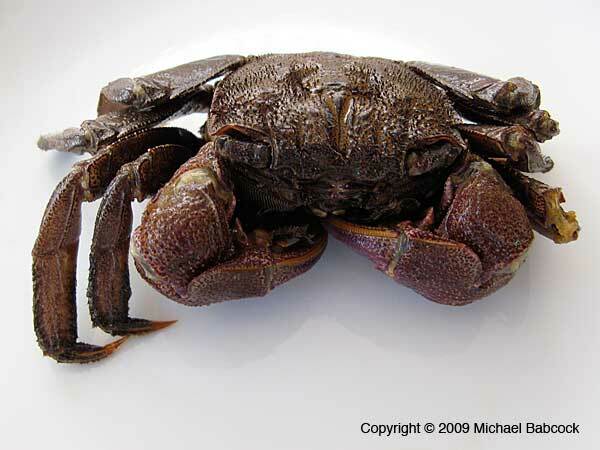 It is also very tasty (see picture below). We’ve since done a whole blog post on Or Tor Kor Market. If you are taking a cab, make sure that the driver takes you to the correct market. 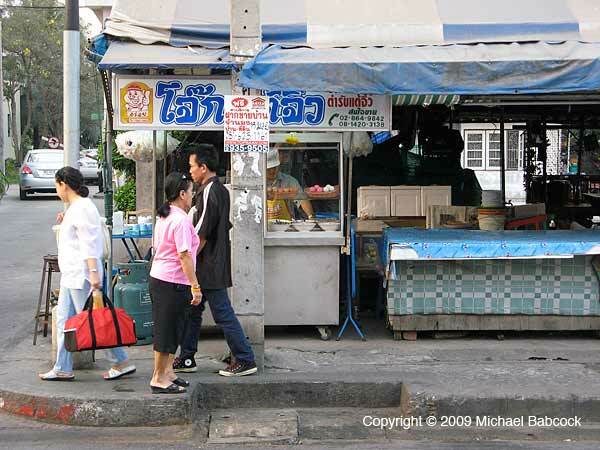 There is also an Aw Taw Kaw Market (Dtalaat Aw Taw Kaw) on Sukhumvit Soi 105 (Soi Lasalle, pronounced Soi “La-sahn”) – it is not as interesting a market. You are currently browsing the Thai Food and Travel Blog blog archives for April, 2009.